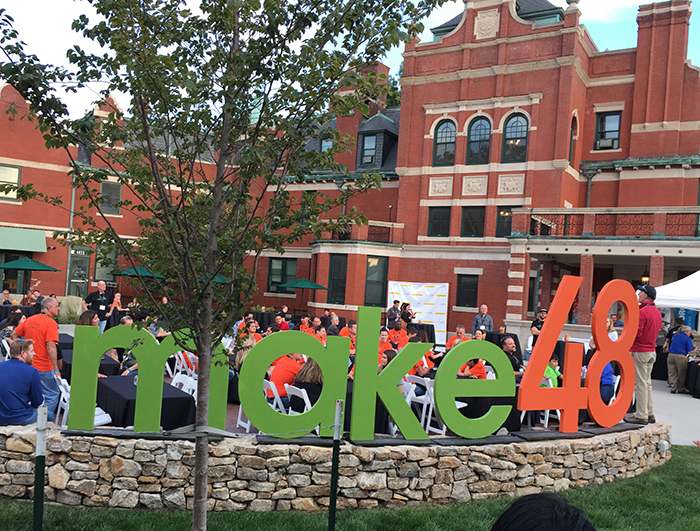 The new TV show, Make48 is kind of a combination hybrid of Iron Chef and Shark Tank. You start off with an unveiled topic and some resources and then set the clock ticking. Twelve teams now have 48 hours to: come up with an idea that fits the topic provided; do a patent search to see if their idea has been used already; prototype the idea–with the help of digital fabrication experts and craftsmen and using materials from a $200 shopping spree at Ace Hardware; throw out your idea already prototyped and try again; stay up late and perfect the idea; build a website and marketing materials to promote the idea; and then, finally, sell a finished product in eight minutes to a panel of experienced entrepreneur judges for constructive and de-constructive criticism. If you got through that laundry list of a sentence without taking more than one breath, you can begin to get a sense of what the two days are like. Now in its second season, the show is hosted by the Kansas City Art Institute, who graciously opened up their campus and MakerSpace to the competition. My son, Bryan, and I were invited as volunteers and “Tool Techs” for the two ShopBot Desktop MAX machines that the school has so that we could help the contestants create their ideas. The teams also had the use of a bank of 12 Ultimaker 3D printers, an Epilog Fusion laser, a makeshift wood and metal shop out in the parking lot, and help from a team of professionals from patent lawyers to GoDaddy website workers. The weekend became a true immersion experience into the world of brainstorming, entrepreneurship, and the design process. The creative leveraging of digital fabrication tools and great design software is what truly enables the success of product idea development in only 48 hours. It was rapid prototyping on steroids with some teams pulling all nighters to get their products completed. Bryan and I finished cutting Friday night around 2:00 AM. We witnessed each digital fabrication machine used for their strengths. The printers were creating plastic fan turbines of several designs that required internal structure and undercutting that could not be created any other way. 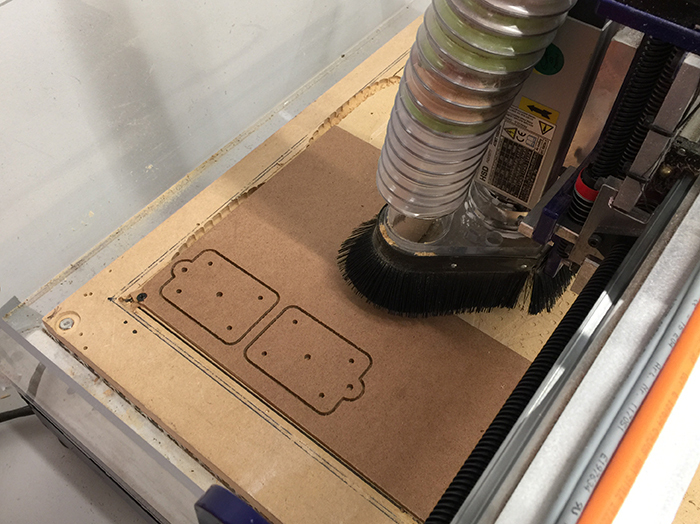 The Shopbot Desktop MAX cut materials like MDF, hardwood, and plywood that the printers can’t use, and the laser was burning away on some acrylic with elaborate etched designs. The efficient workflow from idea to CAD to CAM to NC kept all the equipment active for most of the crunch time. Pivot plate being milled with the ShopBot MAX. The twelve teams were very diverse. One was made up of two high school girls and their Dads. Another was a group of inventors that already had successful products on the market. A husband and wife team came up with a very creative sports game, and an entrepreneur from across the pond in England teamed up with a woodworker from the U.S. Most of the groups had viable and interesting products that were well presented to the judges at the end. Unfortunately, I can’t reveal the products or the winners due to property rights and I don’t want to spoil the episodes for you. The three top winning teams receive ongoing assistance to design, patent, and get their products to market, which will later be a part of the final edit. Bryan and Kyle showing off their skateboard design. 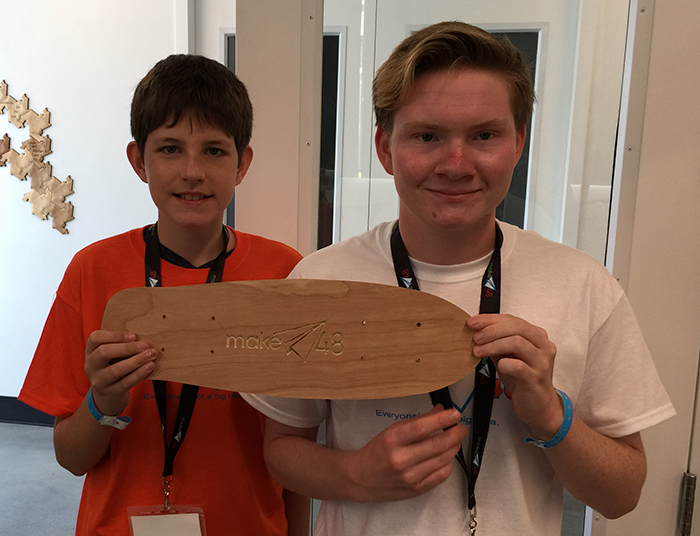 Here is a photo of the youngest ToolTech, Bryan (17) and the youngest team member, Kyle (11) from San Diego who both teamed up to design a skateboard with pivoting wheels to double as a rolling school backpack, an idea that they abandoned early on day two. Another product that I liked was a floating pool hockey game with a never ending supply of water to shoot your opponent’s puck into the goal (SEE VIDEO 2). This game was in violation of two different patents that when combined together shut down another great idea. For more information, and to find out how to be a contestant on the next season, go to their website. There is also a complete listing of viewing times and public TV stations that are currently running season one. 1 comment to Make48 to Air Season Two this Spring!